View of the Okanagan Valley looking Northeast. Black Hills' vineyard sites have been recognized as having some of the best terroir in Canada. Located on Black Sage Road, our microclimate provides us one of the hottest, driest and sunniest sites in Canada. The southwest facing aspect and moderate slope combined with our deep desert sand yields intensely flavourful and complex grapes. As stewards of this incredible piece of agricultural land, we endeauvour to harness the full potential of the land to cultivate the best possible fruit. We are committed to sustainable, environmentally-friendly farming and winemaking practices, that show respect to the land and that role of agriculture in the environmental cycle. Each of our vines is carefully tended by hand, from pruning to picking. We have been awarded Environmental Farm Plan Status by the B.C. Environmental Farm Plan, administered by the Federal and Provincial Departments of Agriculture as well as the BC Agriculture Council and the Investment Agriculture Foundation. We are proud to increase our agricultural sustainability and contribute to a cleaner, healthier environment as we continue to operate under the best practices of the Environmental Farm Plan. We purchased this abandoned 34 acre vineyard in 1996, and set about planting Cabernet Sauvignon, Merlot and Cabernet Franc. Additional varieties planted in the vineyard include Carmenere, Sauvignon Blanc and Semillon. 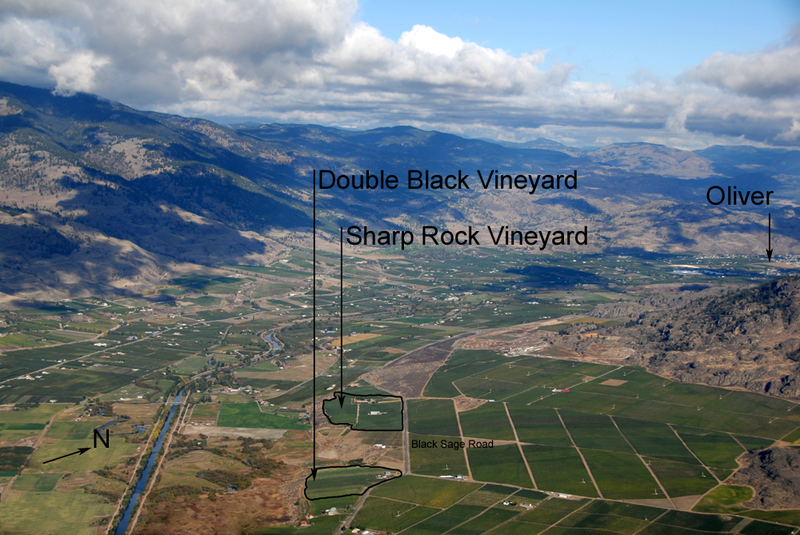 Double Black Vineyard is a 15 acre vineyard located just a kilometre south of our original Sharp Rock Vineyard with very similar terroir. As with the Sharp Rock Vineyard it was originally planted in 1996 with virtually identical clones and rootstock of Merlot, Cabernet Sauvignon, Cabernet Franc and Syrah. After managing the vineyard for a few years, we acquired it in 2011. At that time we upgraded the onsite irrigation system and replaced some redundant grape varieties with new plantings of Carmenere and Syrah.